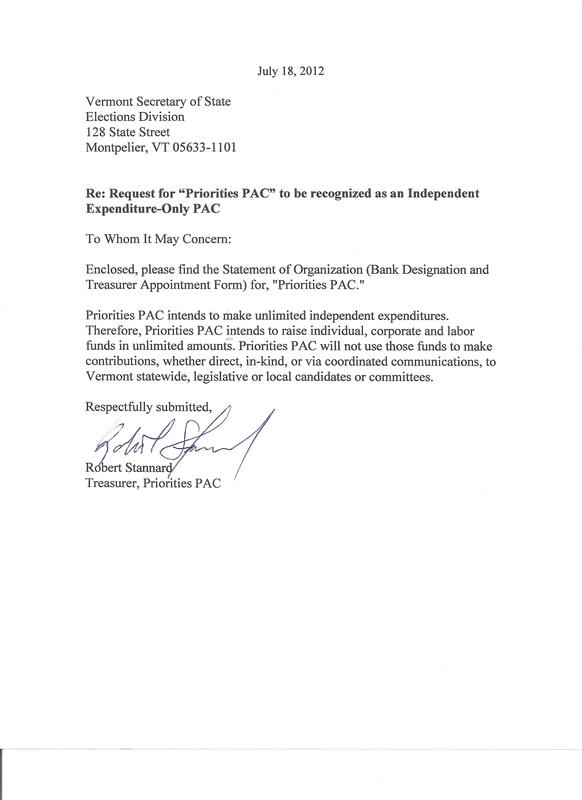 In order to test the waters and confirm that super PACs could legally operate in Vermont, Bailey hopped on over to the Secretary of State's office July 18 to officially register the new entity. It being the first such filing, Secretary of State Jim Condos sought guidance from Attorney General Bill Sorrell's office to determine whether super PACs can legally operate in Vermont. A week later, Sorrell's office released its answer: Yes! Two weeks after that, on August 10, a Washington, D.C.-based super PAC called the Committee for Justice and Fairness — funded by the Democratic Attorneys General Association — plunged $99,000 into television ads supporting Sorrell's reelection bid. By the end of the race, the group had spent at least $184,000 on Sorrell's behalf, almost certainly pushing the attorney general over the top in his squeaker of a victory over T.J. Donovan. In defending the legality of the Committee for Justice and Fairness' support, what did Sorrell cite? His own decision responding to Vermont Priorities' filing. "Earlier this week, Vermont held its first election that included the involvement of a Super PAC. The Committee for Justice and Fairness spent at least $184,000 in support of Bill Sorrell in the Attorney General primary, a race that Mr. Sorrell won by a mere 600 votes." said David Contrada, board member for Vermont Priorities. "It is clear that large sums of out of state money have already had an affect on Vermont's elections. In Vermont, we want our elections to be decided by ideas and values not dollars. This is precisely why VT Priorities will work to eliminate Super PACs from Vermont elections." Contrada added. So, to be clear: Vermont Priorities started a super PAC to ward away super PACs. But because they did so, a super PAC came to town. Now, they're arguing their work is necessary to "eliminate super PACs from Vermont elections?" Update - August 31, 10 a.m.
Replying to a request for comment Thursday afternoon, Stannard wrote by email that his group "did not create the landscape that led to Super PACs in VT," noting that the U.S. Supreme Court's Citizens United decision and other rulings "opened the door for them to operate in our state." "It is fair to say that the board's preference would be that they did not exist but simply wishing for that would be sticking our head in the sand and hoping the issue went away like so many are currently doing with Climate Change. We have instead chosen to take action," Stannard wrote. "Whether we are the group that asked for legal clarification from the Secretary of State or the 10th or 100th group to be created in Vermont is irrelevant." "VT Priorities isn't responsible for their existence," Stannard concludes, "but if we are successful in accomplishing our goal we will be responsible for their elimination.